Security Station W480 Sentry Mobile Workstation - FREE SHIPPING! The AmpliVox Sentry Mobile Workstation has lots of storage and workspace, and it lets you setup wherever you need to: classrooms, conference or training rooms, building entrances, warehouse and production areas and more. It’s also perfect as a security station. Conveniently wire handling grommet holes accommodate electrical and electronic devices. It rolls easily on four casters, each of which can be firmly locked into place. As a final touch, put your logo on the Sentry Workstation. 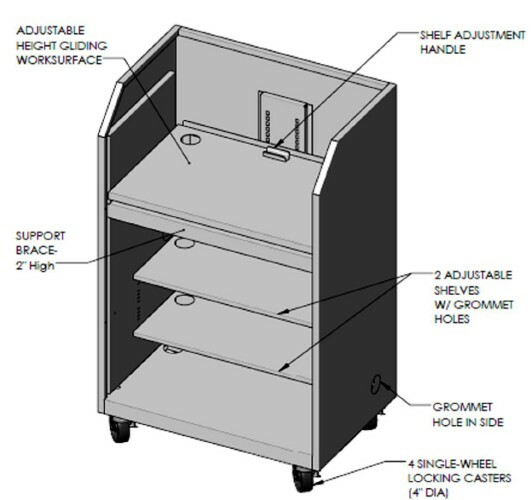 Internal wire management- 7- 2” diameter holes with rubber safety grommets; Two on the bottom panel; One on each side panel, shelf and work surface. Adjustable Range Height: 16" — 14"